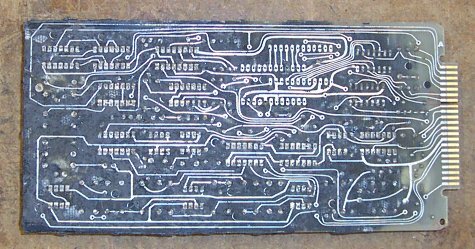 Status: Totally depotted, EPROM dumped, circuit traced out, schematic generated, restuffed and working. There is a single 2704 EPROM on the board. Here's the ROM. In this installment, I will be showing a few more of the de-potting steps than before. 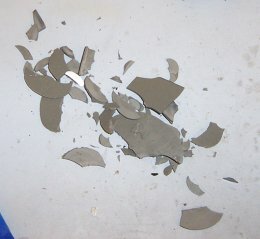 It's kinda gruesome so they were left out on the previous boards :-) First, I have to remove that plastic potting shell. On this board it was particularally tough- it was almost like glass. It kept shattering and coming off in very small pieces. Finally, most of the shell is off. There is still some plastic on the edges, but this was not removable right now. I will remove it later when de-potting starts. Here's a very small pile of the bits that were removed. There's a large quantity of these things ALL OVER the shop- the pieces were just flying 10-20 or more feet away. I will be finding bits for months. 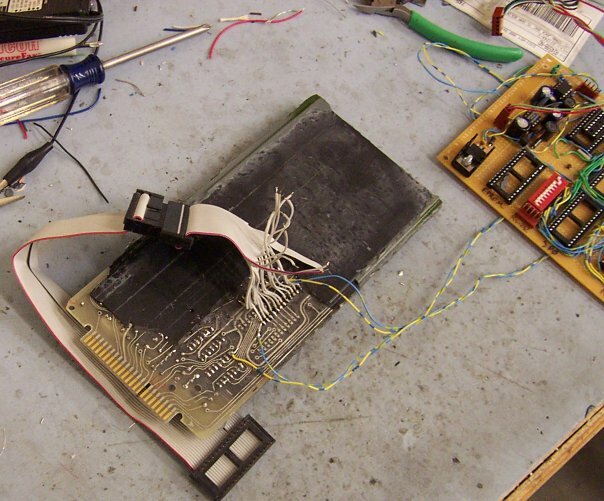 Now, I am going on a fishing expedition to see if I can locate the EPROM... and it looks like I found it. 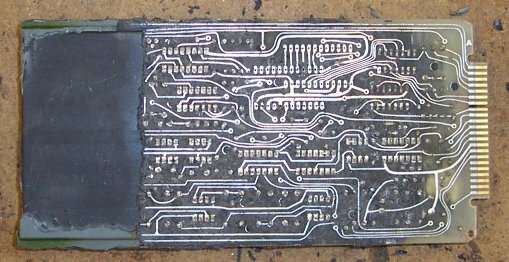 I have removed the potting under it, and added a little solder to its pins so that the EPROM dumping will go a bit smoother. And on the top, the big blob of RTV means we found the EPROM. I removed some of it to make sure we were dealing with a 2704 like before. Now that the EPROM type and orientation is confirmed, I solder the power supply onto the EPROM. This is supplying 5V, -5V, and 12V. 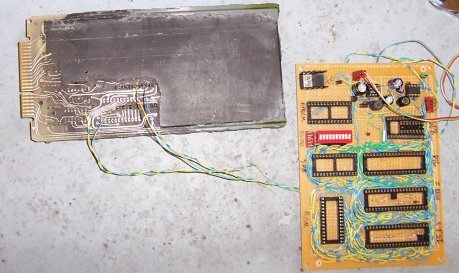 It's really my TSI/Digitalker/SP0256/SPRxxx dumper and development board, but it had the supplies I needed, so I am using it. 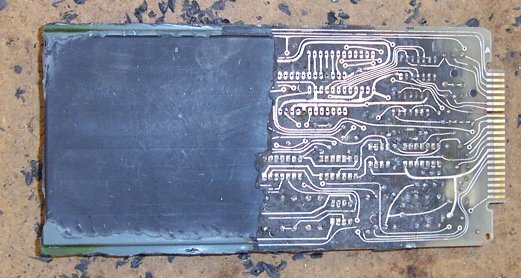 Here's the infamous in-circuit EPROM dumper cable attached. One end is bare wires, the other is a 28 pin DIP header. 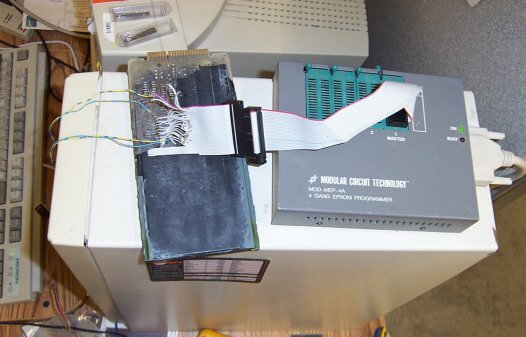 The header goes in the programmer, and a wall wart attaches to the board with the power supplies on it. About 2/3rds of the way done at this point. And finally it is all de-potted. I can see that there is another 15 turn trim pot on the edge of the board similar to the last one. Dunno what it's for, but I can clearly see it is there. I think I see a transistor lurking by a chip, and at least 4-5 more transition generators look likely. Man this thing sure has alot of transition generators! They take up the most space on all of the boards I have de-potted so far. 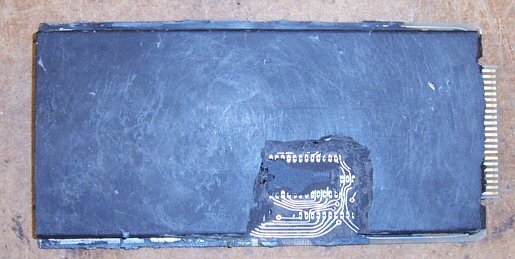 Here's what the top looks like after I extricated the EPROM. 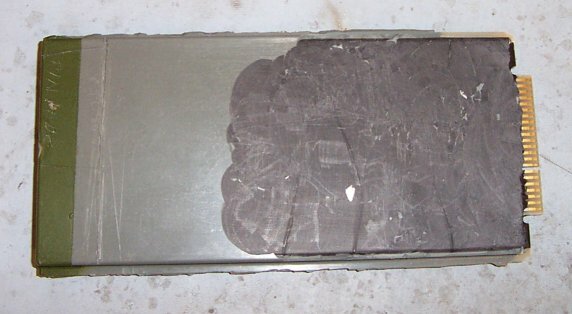 Big ol' chunk of epoxy taken out. 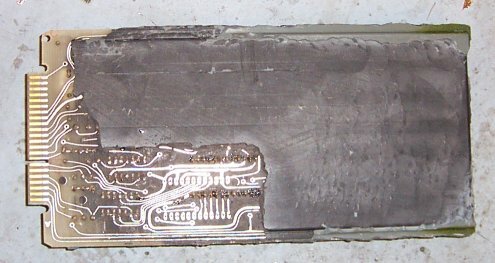 Kind of an angle to show the depth of the potting and some of the parts that are still embedded in it. You have to remove the epoxy to the part then basically dig them out, which usually ends up destroying the parts. 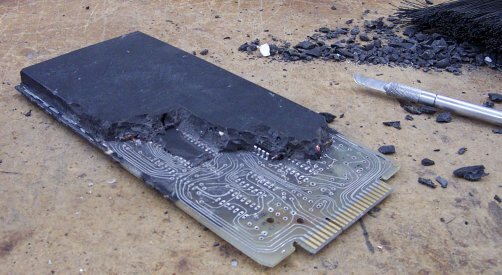 As predicted, this board had a pretty large quantity of passives on it. I am not quite sure why just yet. It will be more clear once the circuit is traced out later. All HTML and graphics designed and © by Kevin Horton .